Welcome to the resource center for the Cerebot Nano! The Digilent Cerebot Nano board is useful for embedded control and robotics projects for both students and hobbyists. The versatile design and programmable microcontroller allows you to control different external devices and program the board for multiple uses. The board has many I/O connectors, power supply options, and supports a number of programming tools including ATMEL AVR STUDIO 4 and WinAVR. Technical description of the Cerebot Nano and all of its features. The Wiki may contain more up-to-date information than the PDF. 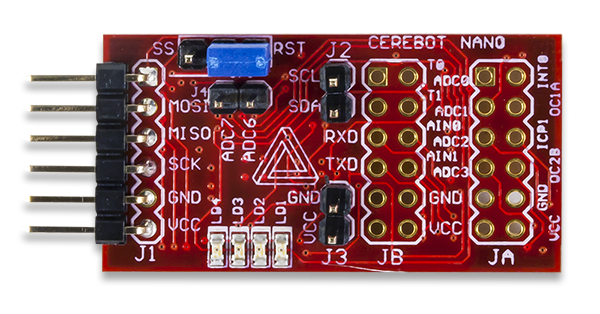 Download A collection of AVR header files describing the pinouts for all Digilent AVR-based Cerebot boards. Download This demo shows how to utilize two PmodRF1 Tranceivers to communicate data. The project is divided into two components, each controlled by a Cerebot Nano microcontroller board which receives temperature data from a PmodTMP thermometer.